I like beer and babies. 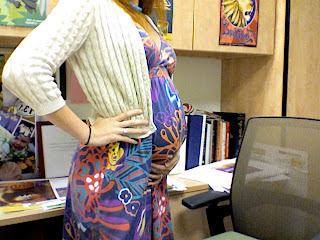 : Preggo my Eggo Update: 26 weeks down, 14 to go. I had my 26-week OB appt yesterday. When I checked in for my glucose test, they asked me when I had stopped drinking (meaning the sugar stuff for the test). I replied, "About six months ago." Three of the nurses fell of their chairs laughing. Two had to leave the room. I knew what they meant, I just couldn't resist. I am closing in on the third trimester. It is a great feeling. Not because I am almost done, but because My Sponsor is now at a point where things will be OK, no matter what. That just takes a lot of weight off. We have an out-of-town wedding this weekend. Not looking forward to 14 hours in a car (7 all in one day) or spending an entire weekend away from The Quiet Contemplator. The closer we get to D-day, the more and more I already feel like I miss her. The thought of her not being the only apple of my eye makes me sad. I know she will do awesome with the transition because she loves to share and is all-around perfect (no doing of ours), but I just feel bad that I won't get to spend as much quality time with her. Plus, we are about to expose her to boy cooties-yuck! Yep, it's beheaded me, again.